the signs may be missed. The distribution of the transillumination can give clue to the underlying cause. Diffuse iris transillumination in albinism. from iris vasculitis. Note: the transillumination can also be diffuse if the involvement is extensive. Sectorial iris transillumination in a patient with iris prolapse during phacoemulsification. Note the area involved corresponds to the corneal incision site for the phaco. 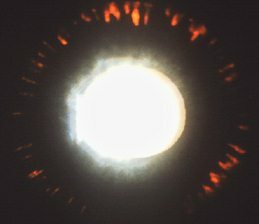 Diffuse mild iris transillumination in a patient with senile iris atrophy.